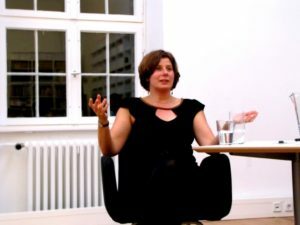 From summer 2014 to summer 2015, Andrea Stolowitz was a playwright-in-residence at the ENGLISH THEATRE BERLIN | International Performance Arts Center in Berlin to research and write her autobiographical play Schlüterstrasse 27. 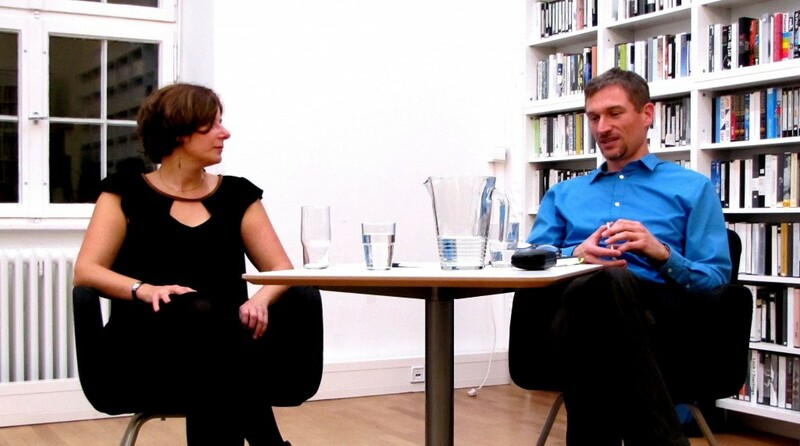 Henning Bochert was her interlocutor at a public discussion sponsored by Drama Panorama: Forum for Translation and Theater in October 2014, an event that included a staged reading of scenes from her play Ithaka, in Bochert’s German translation. Throughout that year, Henning and Andrea repeatedly discussed their respective theatrical backgrounds and realities. This dialogue reflects part of their conversations. HENNING: Andrea, after one year in Berlin you returned to your home in Portland this summer. As a writer-in-residence at the English Theatre Berlin International Performing Arts Center, you developed your new play Schlüterstrasse 27. You also spent the year experiencing the theatre offerings in Berlin. In our discussions, we confirmed that both our countries’ theatrical landscapes are different in many respects. It seems, however, that the situation for playwrights in both countries is changing. ANDREA: Yes. It seems, simply put, that in Germany dramatists have a growing interest in narrative story-telling and more realistic characters. I heard this described by German playwrights as the “British or American” model. This is not a return to the realm of naturalism per se, more like a movement away from the director/auteur model popular in the past twenty years in German theatre where the director’s job is to add his or her interpretation into the staging of the play. I think this method has divorced the playwright from some aspects of storytelling, which they would like to regain. HENNING: We will get to the impact of the so-called Regietheater on German playwriting. But our respective theatrical realities strongly differ in their economic aspects, too. How does the financial aspect factor into your work? Another example: In the US it is still in practice for theatres to commission plays with no guarantee of producing them. This is a problem because instead of granting aesthetic freedom it forces a marketable product. Most playwrights want to see their work produced and will write even unconsciously towards that end. There are theatres of course who commission and guarantee to produce, like Signature Theater in New York. When you read what their resident playwrights say, well it’s amazing. They pretty much say that having a guaranteed production lets them write the kinds of plays they want to be writing that wouldn’t otherwise be written. 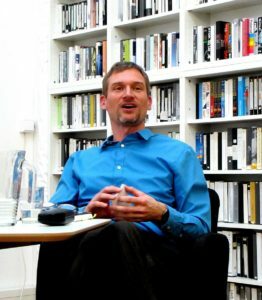 HENNING: As a result of the history of the past 250 years, Germany’s theatrical landscape is largely made up of a rather unique web of public theaters, rather large public houses that were built at central places in cities to be representational bourgeois palaces of culture as opposed to the exclusively feudal theater before. These municipal theaters are traditionally equipped with a public budget supporting an ensemble of actors and technicians and a repertory theater system that is able to show productions over a long period of time instead of just two weeks in a row as is the ruling practice in what is called the independent theaters. So for emerging artists (who really tend to be young here) there really is a fruitful ground to integrate with and to grow in. Moreover, playwrights here, particularly younger, new talent, will find a broad system of public grants, residencies, later commissions and awards, etc. Still, few of the playwrights I know can depend on their writing alone as art is still a luxury in economic terms. Economic infringement on their aesthetic liberty, however, would not be a consequence. In Europe, theater is traditionally expected to be a means for public debate and society reflecting on itself. Even very experimental texts will be welcome for their very form and will most likely find a theater and/or a director with an interest in producing them. In the early 90s, it was the directors who took charge and expanded the artistic liberties of theatre to meet the demand for new aesthetics. In doing so, they assumed a very strong authorship during an era of very influential Regietheater (roughly: director’s theatre) in German theatre. Many of those impulses came from the Netherlands or from groups like Forced Entertainment from England. The shift of focus away from the author and towards performance-oriented factors in theater dates back even earlier, but in the 90’s, it became a common phenomenon. For the playwright, however, this created extraordinary challenges. Many times, the playwright would find his or her text strongly modified with severe cuts or large additions or combined with other works, sometimes even deviating considerably from their texts’ original intentions, by negligent or mischievous directors. One of the most famous cases was the dispute between the ingenious, late director Einar Schleef and playwright Rolf Hochhuth (“The Deputy”) over Schleef’s production of Hochhuth’s “Wessis in Weimar” at the Berliner Ensemble. The writers’ community was split between those who felt that directors in general went too far too often and those who felt that that was a thrilling artistic development and really a positive challenge for a theater otherwise behind reality. Then Hans-Thies Lehmann wrote his famous. book looking back at these developments and coining the term of the “post-dramatic theater” in the very late 1990ies, and theater sciences have not really gotten over that one yet, although this is a moment in theater history now when the signs are changing again. As an example, Bernd Stegemann, dramaturg at Berlin’s schaubühne, is currently touring platforms propagating a return to psychological realism as if that were possible. Many who are tired of the ever same non-psychological aesthetics on stage applaud his passionate quest, while others can’t follow his seemingly conservative call. The performance-oriented Regietheater has weakened the playwrights’ position, but it is exciting to see how they are now finding new means of writing to respond to that situation. HENNING: In Germany it goes without saying for any director that his or her task is to develop a vision for the text, while a U. S. director has a much deeper, legal obligation to respect the text as written, right? ANDREA: Yes, this is true. And I like this. I think the challenge becomes for US dramatists, of how to place aesthetic considerations into the fabric of the text of the play. Can my text become more of a theatrical score and what might that look like? HENNING: US playwrights remain very involved in the various productions of their plays. In Germany, you write your play, and then it is “out there”, being produced mostly without further involvement of the playwright, except for the premiere or in the framework of a commission, of course. But the playwright is also often in a vulnerable situation in the US. No composer will be questioned about why or how she or he employs this or that form or technique, while the artistic integrity of playwrights is constantly infringed upon by the audience, producers, and other well-meaning voices who would actually be writing their own plays – so they say – if only they had the time. HENNING: Yet another difference: I can’t imagine anybody telling a German playwright how to write their play or to try to “fix” it like that. ANDREA: OUTRAGEOUS FORTUNE talks all about this and it is so well documented, but yet still the problem persists. Not in the “best practice” theaters of course, but still in surprisingly many legitimate places. HENNING: Back to aesthetics: what is your own relationship with realism? ANDREA: In the US we are schooled in a Stanislavsky approach to theater training where psychological realism drives the play. Essentially we write plays that actors can act, and since our theater training is so heavily weighted towards naturalism, that is what we write and what we see on our stages. This has changed of course with the rise of the more avant-garde European theater influence in the US. Not only have playwrights begun to work with these companies, they have begun to create text, plays, which reflect a more performative tradition: Just because I am a playwright who creates text with a vision of a whole story, it does not follow that it must be contained within the aesthetic of psychological realism. That feels kind of new for us here. HENNING: I don’t see German playwrights writing for psychological realism anymore. In fact, while German actors training largely depends on psychological approaches, I have myself gone through a training that included non-psychological influences. The aesthetic influences of the theatrical avant-garde, names like Jerzy Grotowski, Tadeusz Kantor, object-theater or influences from other arts like music etc. must be taken into account. We worked with John Cage compositions during my acting training times. Very liberating and entertaining. And playwrights started writing plays that did not involve characters anymore with Peter Handke’s PUBLIKUMSBESCHIMPFUNG (OFFENDING THE AUDIENCE, which in the 60ies was avant-garde) at the latest. Now Elfriede Jelinek’s influential “texts for the stage” are all over Europe, and try to find what you would call a three-dimensional character in them. ANDREA: I think there is a difference between having to write in the genre of psychological realism and between directors needing to put a layer of meaning on the play. I can write in a heightened genre and the director can produce my text. Maybe this is a fusion of the German and American traditions? One of the outstanding plays that came out while I was in Germany was Wolfram Lotz’ THE RIDICULOUS DARKNESS, maybe that is a good example. ANDREA: They loved it. They were thrilled with its inherent theatricality and its playfulness. They had expected a philosophical boring non-sensical German tome – instead they got a modern story with a modern aesthetic. HENNING: Lotz’ THE RIDICULOUS DARKNESS continues to be lauded as a play that remarries exploded theatricality and narrative. In his writing, Lotz integrates the historic changes and the aesthetic demands we mentioned, re-assuming the position of the first visionary in the process without dictating anything. As you say, his play is not caged in by a psychological character-logic or realistic plot and situations anymore, while it clearly follows a thematic logic. HENNING: Let’s talk about dramaturges for a moment. In the German speaking countries, they are influential in steering the main direction of productions, their main trajectory, and the discourses behind them, which must also include the formal frame. As you know, dramaturges may be employed by larger houses to compile the season together with the rest of the artistic direction, and they work within the individual productions together with the directors where their main responsibility is working on the text, building a performance script with the director, supply additional background material for research, etc. This latter role is what dramaturges working freelance will fulfill in productions. ANDREA: In US theater, dramaturges do not enjoy the same lauded role as in German theater. I would say we do not really have a critical discourse about theater in the US as part of the experience of the theater-goer. Since this part of the job is missing in the US, our dramaturges tend to act as literary managers and as rehearsal dramaturges for new plays or for classic plays. They are often a big part of season selection in term of new plays in the season but often not as much when it comes to other plays in the season. The Shakespeare centered theaters like the Old Globe in San Diego really invest heavily in their dramaturgs and I think utilize them in the most similar way to in Germany, but still without the critical component. We just do not have a critical scholarly tradition at the theaters in the US. The world of scholars and the world of production organizations are not fused. HENNING: Andrea, now that you are back, what strikes you most about theater in Portland? ANDREA: Well, two things. 1) Most theaters do not have a bar or restaurant where audience members can congregate before and after the show. I think about the big and small houses in Berlin and there was always some place where you could hang out before and after the show with friends. I miss having a time and public place to reflect about an artistic experience. And 2) In Germany audiences clap forever. The performers keep coming back and the whole applause ritual takes ten minutes. In the U. S., we clap briefly, the lights come on, and we go home. In Germany I was often annoyed with the epic clapping. Now I miss having some extra time to sit with the experience of the play, a transitional time between our play experience and our real lives. As a playwright I miss Berlin. It’s a gift to be in a place where the largest conversation about theater ISN’T how to save it from dying. Andrea is a founding member of the playwrights collective Playwrights West and works as a collaborating writer with the award-winning devised theater company hand2mouth theater. She is a resident artist at Artists Repertory Theater. A Walter E. Dakin Fellow at The Sewanee Writers Conference, Andrea has also been awarded residencies at Ledig House, Soapstone, and Hedgebrook, and Arts Grants from North Carolina, Oregon, and private foundations. She is a 2013 Oregon Arts Commission Fellowship winner. She was the recipient of a 2014 DAAD grant to support her residency with English Theatre Berlin and her research for a new play in Berlin, Germany. 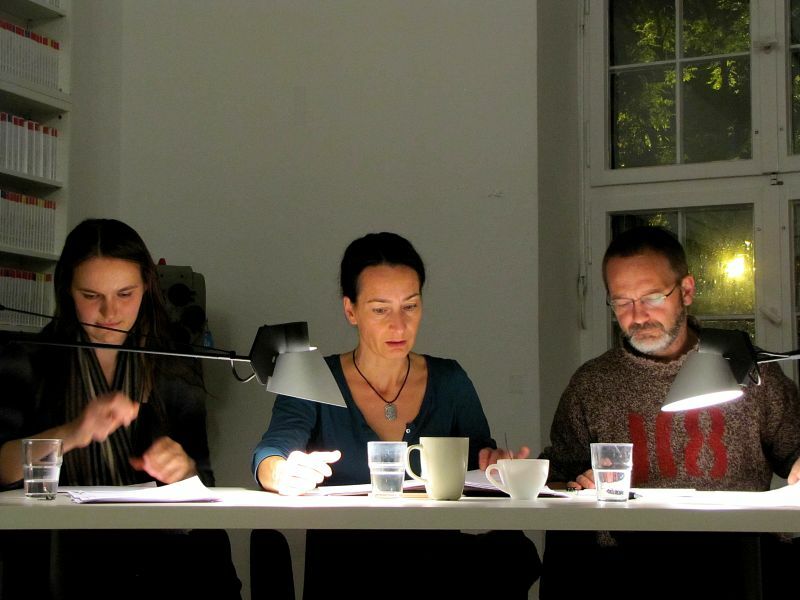 In October 2014, we presented your play ITHAKA at a Drama Panorama event at Kunstquartier Bethanien in German translation (Henning Bochert) and a staged reading.